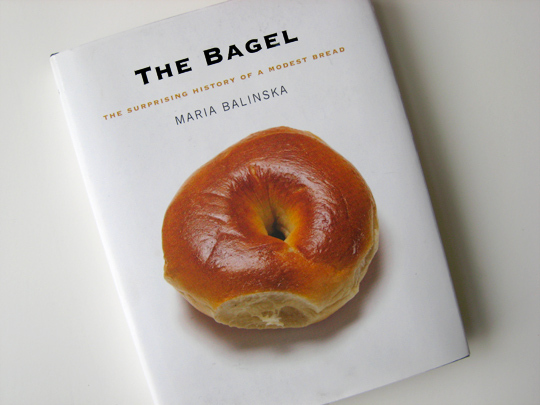 Maria Balinska's The Bagel: The Surprising History of a Modest Bread (buy at Amazon ) reads less like a book on food history and more like a history of Jewish migration from Poland to America told from a very particular and not always convenient angle. The tone is standard-issue pop culture: easy, approachable, accessible. It reads like the type of thing that would be sold at Starbucks or by the register at Borders: small trim, big print, simple premise. I've generally held that books like that aren't really intended to be read. They are there for the stuffing of stockings, for the forgotten sibling's birthday, to be giving at housewarming parties. They exist as the cover and the recipient's recognition — "Hey, you remembered that I like carbs!" To be fair, writing off Balinska's effort like that would be selling her short ... but not by a lot. Much of the book is surprisingly unfocused, particularly early on, although it hits a pleasant stride when Balinska is discussing the labor history of Jewish bakeries in New York. The light tone helps the narrow thematic focus, but I can't help but wonder who this book is intended for. The obvious answer would be the broadly defined "Jewish community," but the account of Jewish-American history doesn't run quite deep enough to be a useful resource for those who are already acquainted with its major moments. Bagel lovers will likely get mired in the murky history of the doughy circle and give up long before they reach the section on the "modern" bagel: the chapter on the Lender family and the rise of the bagel in 20th century America. What The Bagel does do well is present a topic not often discussed: the ethnic bakery. 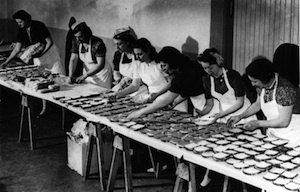 Jewish bakeries, first in Poland and then in New York, had particular restraints: the necessity of producing Kosher food as well as working around the observation of the Sabbath (which became more difficult as bagels become the weekend treat of the masses). Out of such restrictions came the ubiquitous bagel as we know it. Balinska's portrait of the challenges of the Jewish bakery makes me wonder what other dishes have been created out of such necessary constraints. I would love to see a series of books on ethnic bakeries — how great would a book on Mexican bakeries be? Or Halal bakeries? Let Kalinska's The Bagel be the first in a long line of successors, but let them be focused on the people and the process, rather than enslaved to the product.